SUTs are public kiosks located all over. People can interact with them to access various SW City resources and SWI. Both the full terminal and laptop versions are available. 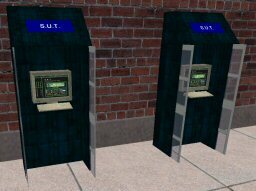 Terminal - Place base object where you'd like the SUT backplate to be. Laptop - Place base object where you'd like the front center of the laptop to be.